For runners and triathletes alike, the weekly long run is a staple workout. Whether one is a 10k runner or a marathon/Ironman competitor, these can vary from 75 minutes to 2 to 3 hours. However, the approach when running them should depend on what phase of training you are in at that point of the year and what short and long term goals are. At their most basic, long runs are used to build your aerobic base. These runs encourage mitochondrial development and increase endurance. During early season or base phase, while the athlete is building an aerobic foundation one can use tools like TrainingPeaks to see if these endurance gains are being achieved. By keeping an eye on the metric pace as it relates to heart rate (Pa: HR) one can observe improving cardiovascular fitness. This metric tracks the change in heart rate vs pace while running at a constant 81-88 percent of threshold heart rate over the duration of a run. For a runner who is increasing distance, heart rate will often rise as time extends, even if the pace remains constant. This heart rate drift is referred to as decoupling; the longer heart rate stays even with pace, the fitter the athlete is becoming. The goal is to keep this number below 5 percent; if Pa: HR rises as distance increases the athlete is not ready to increase distance further. It is crucial that heart rate zones and pace zones are kept current. While using these long runs to build aerobic endurance a runner should strive to be as efficient as possible. Athletes can use a regular route to keep track of running as quickly and smoothly as possible, at as a low heart rate as possible. This is an ideal time to focus on cadence if it is low or working on form and technique. Your runs should start before you even go out the door with nutrition and hydration need to be taken care of, and with having a route mapped out to achieve the purpose of the workout. From steady state endurance runs one can move on to more race specific preparation. One type of run that has been proven very successful with my athletes is the building base run, or “Progression Run”. Typically, I will have athletes build a 2 hour run using 30 minutes Zone 1, 30 minutes Zone 2, and 30 minutes Zone 3 and for experienced runners, 30 minutes Zone 4. This gradual increasing of pace/effort over time is a great simulation of the feelings of accumulating fatigue on race day and builds second half strength and resilience. It encourages mental fortitude as it is challenging to change gears in the middle of the long run. You can also vary paces up and down for a long run with the goal of increasing your ability to hold longer durations at target marathon (or Ironman 70.3) race pace, which is zone 3 heart rate. For instance, after a short 15 minutes warm up Zone 1, run 90 minutes alternating 15 minutes Zone 3, 5 minutes Zone 2-1. Gradually progress the Zone 3 duration over the weeks to 20 and 25 minutes. Another variation of this type of run is to aim for course specific preparation. I wrote a few months back about obtaining an advantage by simulating your “A” race terrain during training. Gearing up for the Boston Marathon is a prime example: the course starts out fast with a gradual downhill, then settles down into relatively small undulations and the iconic “Heartbreak Hill” is 20 miles in. By incorporating a challenging hill at 80 percent of the distance or duration of a training run, you are preparing for what is to come on race day. Likewise, Ironman runs typically occur in the middle to late afternoon when temperatures are at their highest. It makes sense to do one or two long runs in the heat of the day to get the body acclimatized, also on a similar terrain and road surface. Many have found that by exercising at a low heart rate even in extreme heat is very beneficial. This is also a great opportunity to practice race day nutrition and hydration. Getting the stomach used to absorbing calories in the heat pays huge dividends. Along with race terrain simulations, race pace simulations are also very effective. If you plan on running 8:00 minutes per mile off the bike for an Ironman, incorporate long runs that are 15 to 20 seconds per mile faster than goal pace. 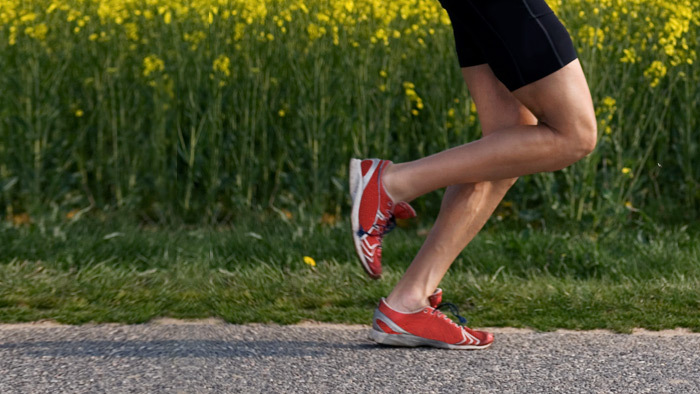 Since the legs are fresher, this slight extra speed is achievable but challenging. To increase strength over long runs, incorporate a structured hill circuit within your 2 hour run. This can be a 30 minute hilly or undulating loop repeated four times. Alternately try 3 to 4 repeats of 25 minutes including 3 x 5 minute hill loop followed by 10 minutes flat. Keep the hills to a moderate grade, less than 5 percent as maintaining form is critical. Since the hills are a part of a longer effort, efficient cadence with a slightly shortened stride becomes effective. In both cases take time splits for the key hills to help gauge even effort for this strength component of this endurance run. Finally, for those training for an Ironman or marathon and plan on running 4 hours or longer for the race distance, completing much more than a 3 hour continuous base run will often result in accumulated muscle damage that is detrimental to overall training and also requires extra recovery time (away from running). In most cases the recovery required outweighs the training benefit. A way to get the body and mind accustomed to what is to these long efforts is to break the 4 hours into a run plus a run/walk component. This can begin with a 60 minute run; followed 60 minutes as 14 minutes run, 1 minute walk; followed, by 1 to 2 hours as 6.5 minutes run, 1 minute walk. The run segments get shorter for each hour while the walk remains constant which means muscles don’t get quite the breakdown. This is just one way of breaking the run/walk strategy down; another is to keep the run interval constant throughout. I have also found that a 4 minute run followed by a 1 minute walk to be a very effective strategy. Use the 1 minute recovery to stay on top of nutritional strategies and hydration. Base running will make you a stronger runner, but honing in on purpose and goal setting will allow you to maximize performance gains.